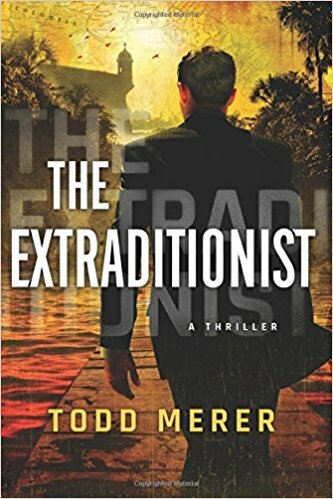 Lawyer Todd Merer spent the bulk of his career defending drug crime bosses and brings that experience to his thriller The Extraditionist. It’s a strong debut with that insider’s knowledge, one that Auntie M bets will soon be on the Big Screen due the violent and yet seductive world it describes. Lawyer Benn Bluestone has a name for getting results, and then basking in the glory as he represents cartel bosses and feeds their secrets to the Justice Department in return for reduced sentences for his grateful clients. He’s a man who flirts with danger and walks on the edge, and decides to walk away after three final cases that will represent his biggest challenges and biggest thrill. Could one of his clients in reality be a Colombian drug king? That case could fund a very nice retirement for Benn. Only he doesn’t contemplate the cost. It will be a race for Benn to escape with his life as he juggles the cases, beautiful women, hit men and corrupt cops and how they merge and threaten his own life. There will be shootouts, hidden videos, and druggings as things spiral out of control. And all along, Benn feels he’s being played. Brief snippets from the head villain that the reader knows but Benn doesn’t intersect the action and add to the tension, with the villain counting on Benn’s greed to get him what he wants, while Benn’s life hangs in the balance. This world of drugs, DEA agents, unscrupulous women and drug-war funding will make the reader’s head spin trying to figure out who is clean and who isn’t. A startling and dark debut.